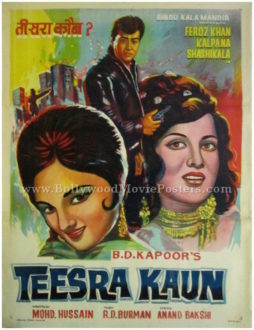 Old hand painted Bollywood movie poster of the Hindi film Teesra Kaun (1965) for sale. 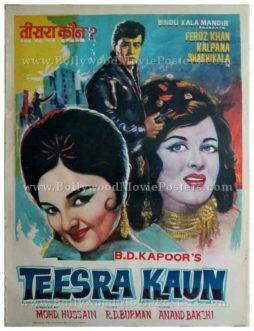 Featured here for sale is an original vintage hand painted Bollywood movie poster of the 1965 Indian film that starred Feroz Khan, Kalpana and Shashikala in lead roles. Printed and circulated a few years after the original release of the film (late 1960s), this hand painted Bollywood movie poster was originally designed for publicity of the film but never ended up being used. This old Bollywood poster features quirky hand painted artwork and was designed originally on canvas by a small time art studio in Delhi. Large hand painted faces of the two leading ladies from the film are seen on either side of the poster. The lead protagonist is seen holding a pistol on the top. This hand painted Bollywood poster has an action scene sketched as a suggestion in the background, giving away the theme of the film.